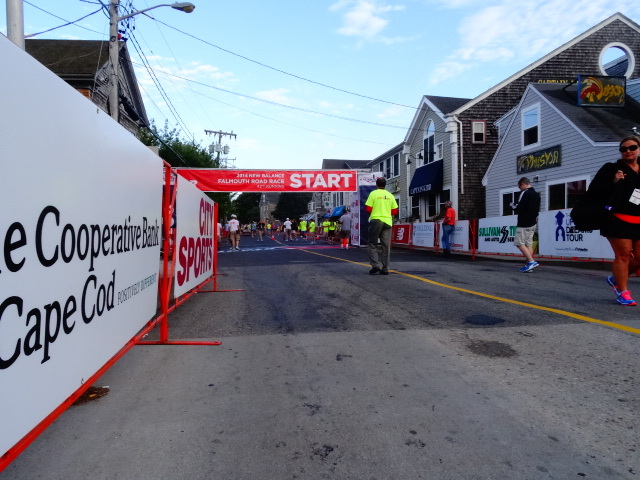 Little late, I know, but here’s a look back from the lead men’s press truck at last Sunday’s 46th New Balance Falmouth Road Race. 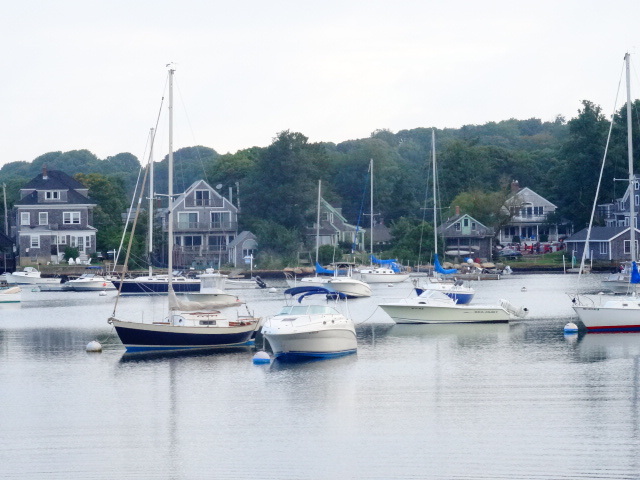 A gray summer’s day for those heading to Martha’s Vineyard. 64F at the start. Great Britain’s Chris Thompson leads the way coming off 11th in the 10,000 & 9th in the 5000 at the European Championships in Berlin. Chris Thompson, leads 2x Falmouth runner up Leonard Korir, Northern Arizona Elite’s Scott Fauble and US Army WCAP’s Haron Lagat in a strong early push. Scotland’s Callum Hawkins (white over red) shows early interest, coming off 7th place at the TD Beach to Beacon 10k two weeks ago in Maine. Took 9th at the 2016 Olympic Marathon, 4th last year at the World Champs in London. No damage to the pack after a 4:34 opening mile. But 4x defender Stephen Sambu in black enters the picture. Sambu is the only 4x men’s winner in Falmouth history, and came in off a second place finish at the TD B2B 10k two weeks before. WCAP’s Haron Lagat in white and ZAP Fitness man Andrew Colley in blue on the left both have shown good form this summer. Cheering fans help the runners through the first three miles of rolling hills. As the course rolls down out of the tree cover, Sambu presses, passing three miles in 13:58 (4:40 3rd mile, off a 4:44 2nd). University of Michigan star Ben Flanagan falls in with WCAP’s Korir and Lagat, Colley and Fauble. 12 strong hit the flats as the boys roam the coast along Vineyard Sound. Callum Hawkins leaking off the back. Chris Thompson and GBR’s Ross Millington (yellow #9) still holding. Four miles fall in 18:36 (4:37) as a steady headwind negates the clement 66F temperature. 10 still remain. A well defined lead pack now separates, led by defending champ Stephen Sambu. Today’s splits right in line with the last three years when the winning time ranged from 32:10 to 32:17. Chris Thompson (far left) finally gives way between 4-5 miles. This is the traditional place on the course when the finalists are determined. Philadelphia Med school student Martin Hehir (yellow on left) well positioned coming off 8th place at July 4ths AJC Peachtree Road Race in Atlanta. Colley in blue on the right took 6th there. Still 10 strong turning off the water and heading through the neighborhood section of the course. Sambu still in front at 5 miles – 23:14 (4:38) – as the men begin picking through remnants of the pro women’s field. The final six take a left and head toward Falmouth Harbor, Left to right: Martin Hehir, Ben Flanagan, Stephen Sambu, Haron Lagat, Leonard Korir, Scott Fauble. Toughest part of the course, too far out to smell the barn, but five-plus miles in and hurting. 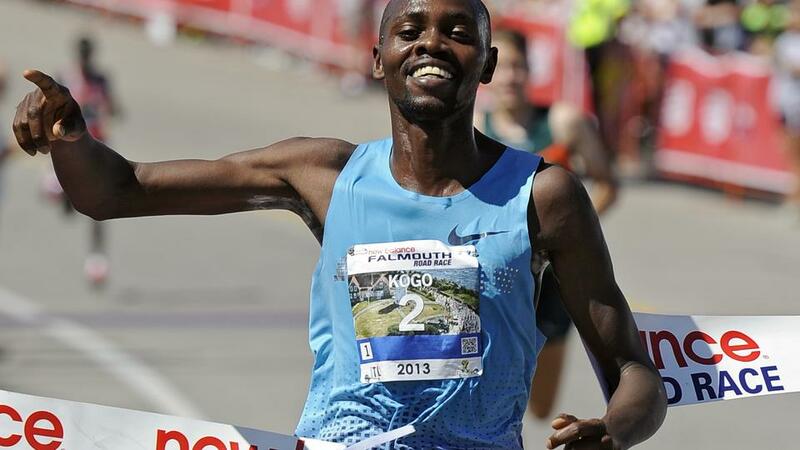 Sambu had established a good lead by the time he reached Falmouth Marine in each of the last four years, but he’s a little under-raced this summer as he heads toward the Chicago Marathon in October. With Falmouth Harbor off their right shoulder, the final six take one another’s measure. NCAA 10,000m champion Ben Flanagan took 2nd at the Bix 7 in Iowa after placing third at the Canadian Nationals at 5000m and winning a road mile in Ann Arbor. He’s the man with the speed. Six miles in 27:52, 10k in 28:49, no records today, but we’ve never seen six men still together this late in the race. And the crowd drives them even harder toward home. And it’s the rookie, The Wolverine, Ben Flanagan, flashing his heels and romping to the tape with a giant smile creasing his face. NAE’s Scott Fauble a breakthrough in second. Leonard Korir on the podium for the fourth straight year in third. Sambu relegated to fourth. Go Blue! Michigan Hugs all around. Falmouth Road Race board member Scott Ghelfi and family hosted Ben during his stay in Falmouth. He just about lost his voice shouting out Ben’s win over the PA.
Saluting Canada’s first ever Falmouth champ. And in they come, neatly 12,000 in all. Just behind the finish line the Crow’s Nesters take in the action. After his win, Ben heads to the Crow’s Nest to celebrate, while receiving a well-earned standing O.
Brad Hurst awards Ben his Crow’s Nest tee shirt, which, according to no less a source than Malmo himself, is Falmouth’s equivalent of the Masters green jacket. 2x Boston Marathon champion Geoff Smith hails a Commonwealth man’s win at Falmouth, a first since Dave Murphy’s double in 1984-‘85. Kickin’ back, reliving the day. Many of the Crow’s Nest crowd raced against University of Michigan women’s coach Mike McGuire back in the day. Mac texted Ben the address and said go up and say hi. Overlooking Falmouth Heights, a place Ben will long remember. Thanks for coming along for the ride. See you next year. Falmouth, MA. – Timing and Tommy, what a combination. The end of the summah (sic) on old Cape Cod and the hospitality of race founder Tommy Leonard, put them together and what you get is what has come to be known as The Great American Road Race. 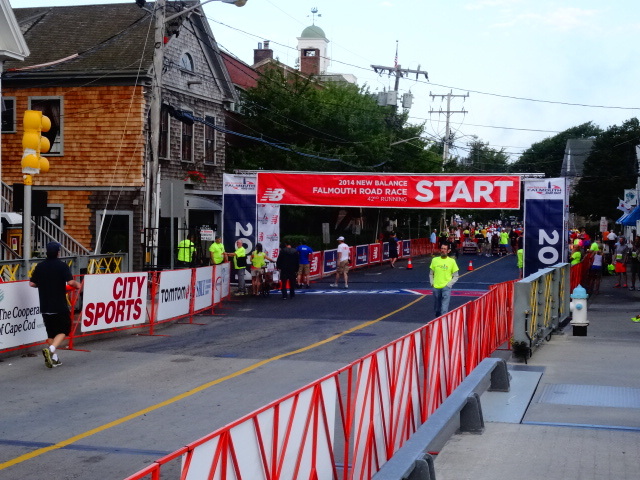 This Sunday the New Balance Falmouth Road Race celebrates its 45th running. Today, race weekend kicked off with a press conference at the Casino Wharf overlooking a gray Vineyard Sound and the finish line of the 7-mile summer classic. Defending champions Stephen Sambu (3x open men’s division), Katie Mackey (3x women’s Aetna Mile) and Tatyana McFadden (2x female wheelchair division) headlined the proceedings. But Falmouth weekend is very much a family reunion, too. Falmouth, Ma. — Charming, but telling, comments yesterday by Kenya’s Micah Kogo after his New Balance Falmouth Road Race sprint finish win over a determined Ben True of Hanover, New Hampshire (not to mention fellow Americans Abdi Abdiraham and Ben Bruce who took places four and five after joining Kogo and fellow Kenyan Emmanuel Mutai through the 10K mark of the seven-mile race). Asked to go through the race from his vantage point to see how it compared with my view from the lead vehicle calling the race, the 2013 Boston Marathon runner-up described trying to push the pace after three miles as the historic course spilled out of the wooded section onto Surf Drive along Vineyard Sound.